Three new ZPMC super-post-panamax twin lift quay cranes with a 24-row outreach and a 49-metre height have arrived at Busan New Container Terminal (BNCT). 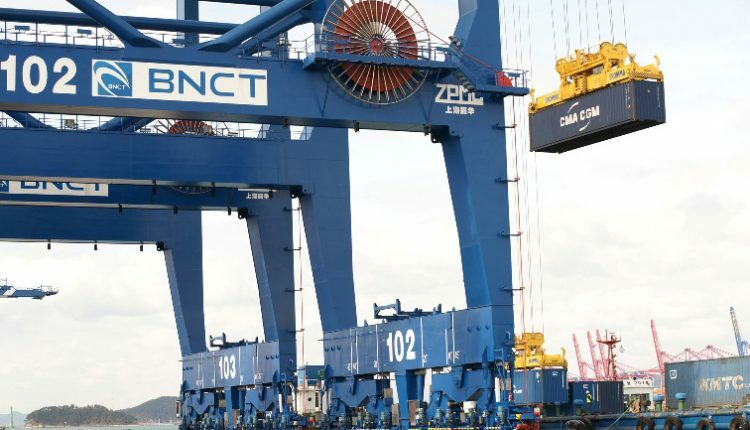 With this addition BNCT has a new total of 11 STS cranes with a total handling capacity of 2.5 million TEU. John Elliott, CEO of BNCT, said: “With no additional terminals planned to open until after 2019 in Busan, and with all other terminals in New Port operating near their maximum capacity [now], BNCT is the only container terminal able to provide Busan Port with major additional capacity, especially for mega-size vessels. Already in its third year of operation, BNCT has shown steep growth, handling over 1.4 million TEU in 2014, an 18% increase over 2013.